Sometimes it’s not so easy to finish and publish a recipe exactly as planned. On the one hand, I don’t have quite as much time as I would like to work on this blog, and on the other hand, I’m easily distracted by shiny objects. In this case, the shiny object was a serious craving for brownies. I have been working on two different recipes for over a week now, one for a wonderful butternut squash soup and one for the most incredible homemade baguettes. I have a list a mile long with my favorite recipes and new ideas that I can’t wait to share with you, and I promise that I will get around to them all. 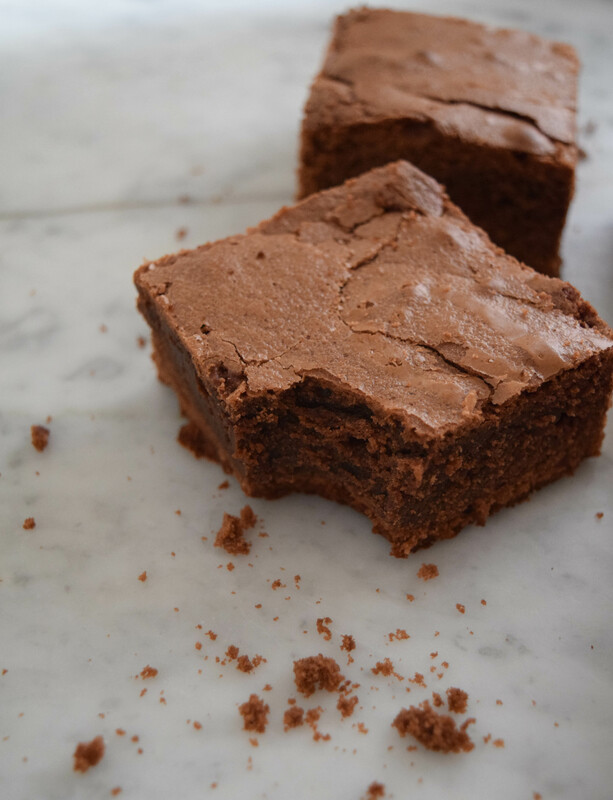 But when my stomach demands brownies, I simply can’t get my brain to focus on anything else, however frustrating (albeit delicious) that may be. So I hope you will enjoy this little detour, I know I did. Don’t skimp on the chocolate. 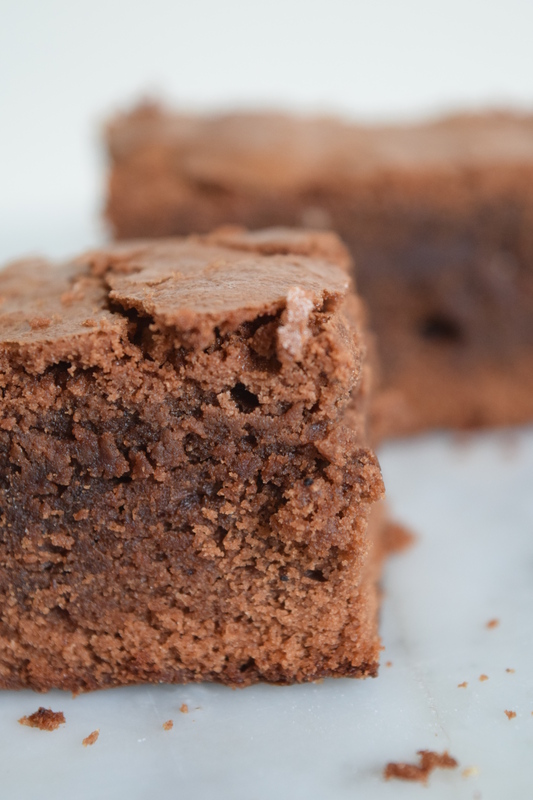 The better the chocolate, the better your brownies will be. You don’t have to spend a fortune, but good semi-sweet chocolate is key here. I like to go with Ghirardelli chocolate chips. The reason I use real chocolate instead of cocoa powder is that all the cocoa butter in the chocolate will make the brownies even more fudgy. 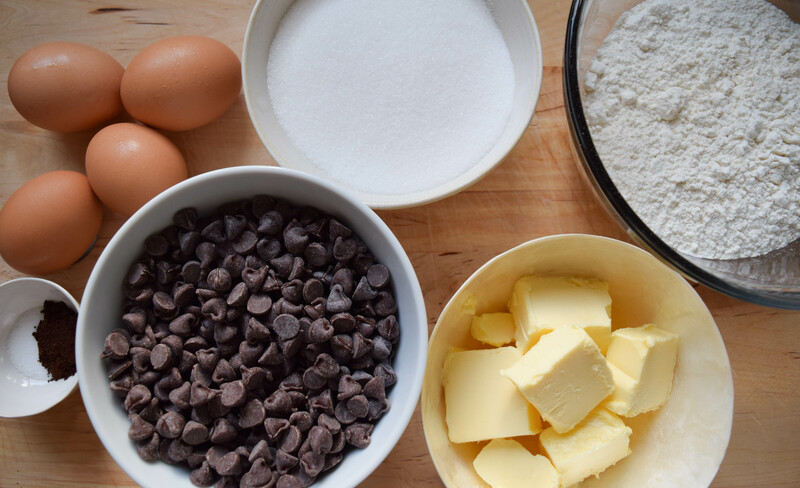 If you like your brownies a little less sweet, you can also use dark chocolate. Don’t skip the coffee. I promise that your brownies will not end up tasting like a mocaccino. A small amount of coffee simply enhances the chocolate flavor and makes it stand out more. If you are really worried about it, just use a little bit less when you try the recipe for the first time. If you don’t have a coffee grinder that has a super fine espresso setting, it’s probably easier to go with instant coffee instead. I use a small electrical coffee/spice grinder to grind the coffee beans into a super fine powder and it works like a charm. Every oven is different. Just like for any other baking recipe, I recommend checking for doneness about 5-10 minutes before the baking time listed in the recipe has elapsed. For perfect results, keep track of how long you baked something until it was done. Once you have made the same recipe a couple of times, you’ll know exactly how long it needs to bake in your oven. To melt the chocolate, you can either use a double boiler or a microwave. – To melt it in a double boiler, heat water in a pot, place the chocolate in a heat-resistant bowl (ceramic, glass, or metal) and place the bowl in the pot. When the water begins to simmer, take the pot off the heat. Be careful not to splash any water into the chocolate, as it will seize and turn into a lumpy mess. Remember to give it a good stir every couple of minutes to keep it from burning at the bottom and to help it melt faster. – To melt chocolate in a microwave, place the chocolate in a microwave safe bowl and microwave it at about 20%-50% power (low) for 20 seconds, stir and repeat until it is mostly (but not completely) melted. Keep stirring until it is smooth. Resist the urge to leave it in longer or crank up the power to avoid burning the chocolate. Butter and flour a casserole dish or deep baking pan (I used a 7 x 10 inch-casserole dish). Mix the butter, sugar, and eggs until smooth. Add the melted chocolate and stir until well incorporated, then add salt, coffee, and flour. Place the batter into the casserole dish and distribute it evenly using a spatula. Bake at 350°F for about 35 minutes. Check for doneness after 25 minutes by sticking a cake taster or tooth pick in the middle, then keep checking periodically to avoid overcooking. Ideally, the batter should not be liquid anymore, but there should be little moist bits sticking to the tooth pick when you pull it out. Serve warm with ice cream or let them cool to room temperature.